I honestly did not want to like The Chew when it premiered back in September. The name sounded silly, and I really didn’t need yet one more show to watch. But watch I did. And I got hooked. The hosts – Mario Batali, Michael Symon, Carla Hall, Daphne Oz, and Clinton Kelly – seem to be having fun sharing some really good recipe ideas that seem simple enough to make. While sometimes they’ll have a celebrity guest or two, it’s all about the food. Right now, there are nearly 100 Thanksgiving recipes that you can find online at The Chew’s Thanksgiving Headquarters. All their shows for the past week and a half have focused on Thanksgiving, so it’s nice to see all the recipes in one spot. 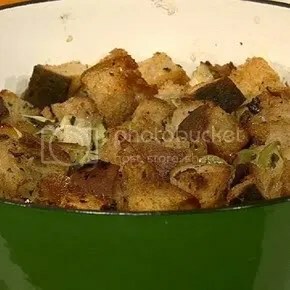 Two that stood out to me are Daphne Oz’s Chestnut Soup and Clinton Kelly’s Sourdough Stuffing with Apples. I’ve never cooked with chestnuts (and we have a tree in our backyard) so I find this soup intriguing. The stuffing… well, I’m always looking for a good stuffing recipe! 2. Cube bread, and toast on baking sheet until golden, about 15 minutes. Once toasted, transfer to bowl. 3. In a saute pan over medium-high heat, heat a tablespoon of olive oil, and saute sausage until cooked through, about 10 minutes, breaking into small pieces. Once cooked through, transfer sausage, retaining the fat in the skillet, to the bowl with the bread. 4. Saute the onion and celery in the pan with the sausage drippings until soft and transluscent, about 10 minutes, then add to the sausage and bread mixture. 5. Add butter to same skillet, until tender, about 5 minutes, add herbs, apple and raisins and cook an additional minute. Return the sausage, celery, onion, and bread to skillet and mix. Add the eggs to the stock and mix into stuffing. Season with salt and pepper, toss, then transfer contents to a baking dish and bake at 350 until golden brown, about 30 minutes. Doesn’t that sound good? 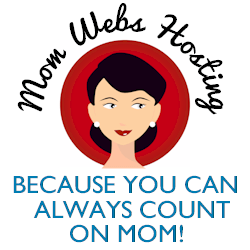 And super easy? 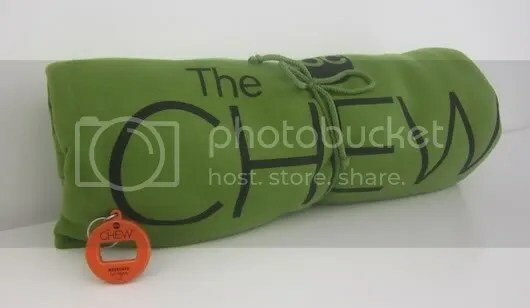 The Chew crew would like to give a reader of The Domestic Buzz a blanket and keychain/bottle opener, both with The Chew logo. Pictured below, it would make a fun gift for a fan of ABC show. To enter to win, please visit The Chew’s Thanksgiving Headquarters and leave a comment below telling me which recipe sounds the yummiest to you! The Chew air weekdays at 1pm et/12 pt/c on ABC. You can continue the conversation with The Chew on Facebook. Michael Symon’s Thanksgiving Benedict sounds amazing! Never thought of making it that way before. The white chocolate cranberry mousse sounds wonderful to me! Michael Symon’s Pumpkin Chocolate Bread Pudding not only sounds good–I made it for Thanksgiving and it was wonderful!! !